From NASA’s Image of the Day Gallery. Beautiful unannotated images can be seen from ESA’s site. It is only one footprint in a mosaic of 33 footprints covering the entire Saturn ring system (including Saturn itself). At each footprint, images were taken in different spectral filters for a total of 323 images: some were taken for scientific purposes and some to produce a natural color mosaic. This is the only wide-angle footprint that has the Earth-moon system in it. Earth, which is 898 million miles (1.44 billion kilometers) away in this image, appears as a blue dot at center right; the moon can be seen as a fainter protrusion off its right side. An arrow indicates their location in the annotated version. (The two are clearly seen as separate objects in the accompanying narrow angle frame: PIA14949.) The other bright dots nearby are stars. 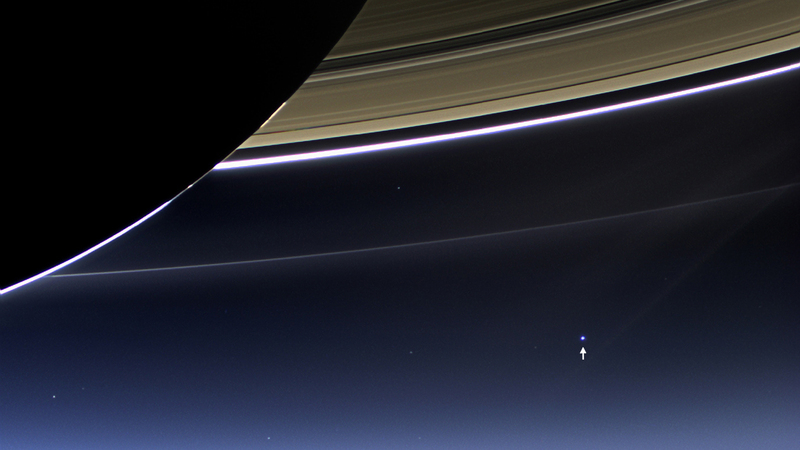 This is only the third time ever that Earth has been imaged from the outer solar system. The acquisition of this image, along with the accompanying composite narrow- and wide-angle image of Earth and the moon and the full mosaic from which both are taken, marked the first time that inhabitants of Earth knew in advance that their planet was being imaged. That opportunity allowed people around the world to join together in social events to celebrate the occasion. This view looks toward the unilluminated side of the rings from about 20 degrees below the ring plane. Images taken using red, green and blue spectral filters were combined to create this natural color view. The images were obtained with the Cassini spacecraft wide-angle camera on July 19, 2013 at a distance of approximately 753,000 miles (1.212 million kilometers) from Saturn, and approximately 898.414 million miles (1.445858 billion kilometers) from Earth. Image scale on Saturn is 43 miles (69 kilometers) per pixel; image scale on the Earth is 53,820 miles (86,620 kilometers) per pixel. The illuminated areas of neither Earth nor the Moon are resolved here. Consequently, the size of each “dot” is the same size that a point of light of comparable brightness would have in the wide-angle camera. For more information about the Cassini-Huygens mission visit http://www.nasa.gov/cassini and http://saturn.jpl.nasa.gov or European Space Agency’s site at http://www.esa.int/Our_Activities/Space_Science/Cassini-Huygens. This entry was posted on Wednesday, July 24th, 2013 at 9:05 am	and is filed under English, General. You can follow any responses to this entry through the RSS 2.0 feed. You can leave a response, or trackback from your own site.